e+Chess available now on iTunes! 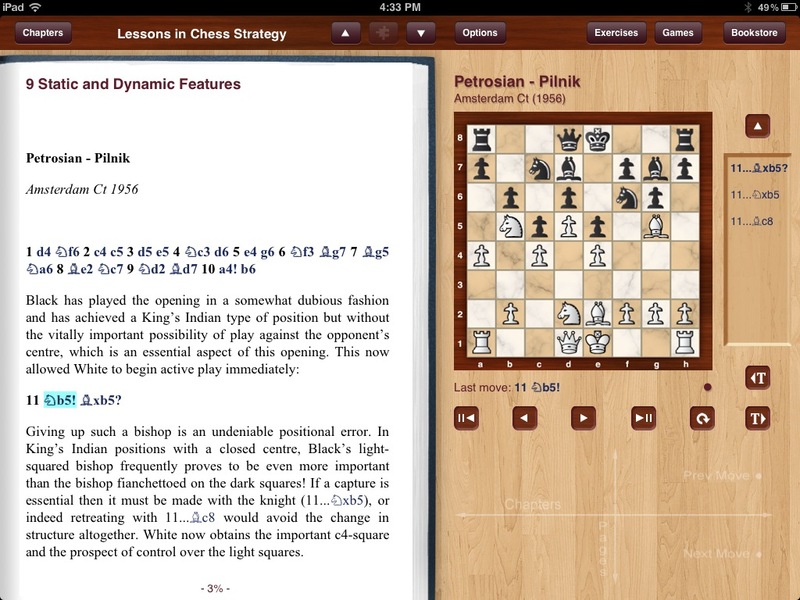 Chess books for the iPad - more than just text! Ever wished you could just tap on the moves in your chess book, and they would play themselves on the board? Ever sighed at the author's recommendation that you use one chess set to follow the main line and a second to play out the variations? And taking a chess book to bed to read - well, that's just something the really good guys do, the ones who don't need a chessboard at all. Your problems have been solved, by a bunch of people who have been there, done that, and lost pocket set pieces in the bedclothes or down the back of the sofa. Now you can read chess books anywhere, without a set, following every move on the built-in board. Download the free iPad app, e+Chess. Read and play through the free chess book contained in the app: the classic Chess Fundamentals by Capablanca. Check out the Complete List of Published Titles to see the other books that have been 'activated' like this. And see the other interesting forthcoming titles that will be available shortly. Watch the video, which says it so much better than words! As chess enthusiasts, one specialist area for the e+Books team was the diverse and interesting realm of chess books. Experience in chess publishing, coaching, and playing helped us to create e+Chess, the app which brings chess literature to life in the era of electronic books.